Intended use: All runs except trail. Suitable for all foot strike positions. 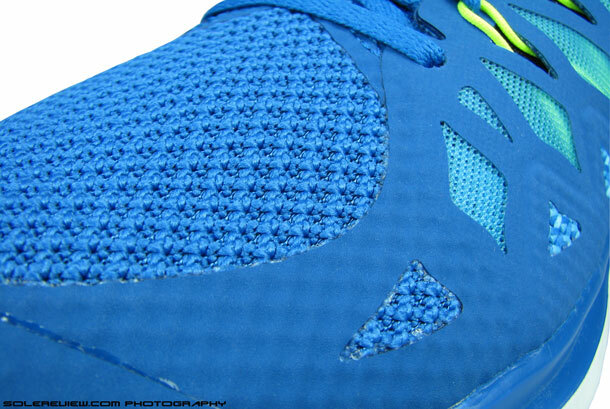 Upper: Fused synthetic leather on mesh, midfoot Flywire cords, knitted mesh. Midsole: Injection molded EVA variant, 8 mm heel to toe drop. The 2014 Nike Free 5.0 is part of Nike's major reset of the Free running line, with outsole design geometry and upper aesthetics taking a new leap forward. These changes translate into a shoe which has a seamless heel-to-toe transition, excellent cushioning and abundant forefoot room. Just watch out for the rogue forefoot seam mentioned in our review. The Nike Free’s 10th anniversary. The last ten years have gone by rather quickly. For it was in July 2004 that Nike introduced the Free concept to the world, inspired by Stanford running coach Vin Lananna’s coaching techniques. Vin had his athletes train barefoot on grass, with the goal of strengthening foot muscles. Nike’s Free concept sought to emulate that experience at some level by offering a degree of flexibility unprecedented in running footwear. As it turned out, the shoes were much ahead of their time. It was a U-turn as far as footwear design was concerned, challenging the paradigm that more cushioning and support is good. People were skeptical initially, and minor bugs like the thin heel mesh tearing off quickly and premature outsole wear did not help the cause. The minimalist boom was yet to arrive, which meant runners transitioned straight from a foam and mesh overdose to a Nike Free detox, getting sore body parts in the process. What is remarkable though, is that despite Nike’s reputation of having a short attention span (Alpha project, Shox, tuned air, anyone? ), it kept on pushing the Free with fierce aggression. Every year after 2004 saw a slew of new Free models added to the line, but not without some notable missteps. But Nike needn’t have worried, because the minimalist running movement accelerated at hyperdrive speeds after 2009. With the running populace (and industry competitors) adopting running footwear minimalism, Nike’s original segmentation of the Free series returned in 2013, with 3.0, 4.0 and 5.0 versions claiming their rightful places in the hierarchy. Nike Free 3.0 being the most minimal, the Free 5.0 being an entry into the Free line, and 4.0 sandwiched between these two. Naming conventions aside, the Free 5.0 has always been Nike’s push in this category because of its neutrality, and hence its appeal – a shoe which balanced extreme flexibility and traditional shoe benefits like cushioning and support. It is best to start in the front, where the Nike Free 5.0 sees a clean, near seam-free execution. Moving forward from a traditional, stitched-on overlay construction of the 2013 Free, this year’s 5.0 forefoot uses Hyperfuse layers over a mesh which is textured like Flyknit and fits gorgeously. The lining beneath is a single layer mesh bonded to the underside and its coverage extends from mid foot onwards. Owing to the materials and design, the forefoot area is effortlessly flexible, allowing the foot to bend naturally. 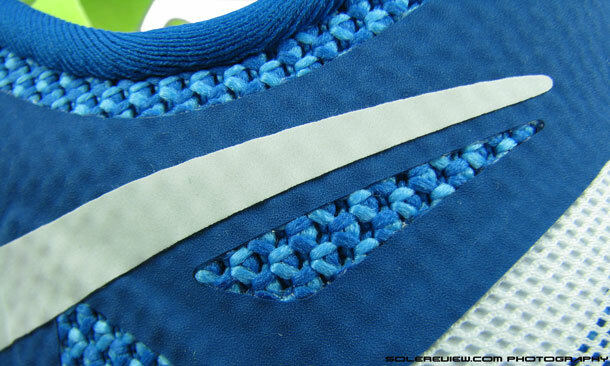 There are no overlays on the arch side of forefoot, and that area is only covered by the mesh. On the toe bumper, part of Hyperfuse extends to cover the toe area with a small mesh window – a canopy of sorts for the big toe. If there’s one big plus we’d like to call out, that’d be the forefoot space. The combination of material and pattern engineering results in an abundance of forefoot space, giving the toes enough room to splay out, with room available both across and vertically. On the flip side, a minor mis-engineering of the Hyperfuse overlays comes to light during runs, which we’ll cover in the dislikes section at the end of this review. The Hyperfuse cut-outs and mesh detail look amazing. See the red stitches at the base? Place where Flywire loops start their journey. 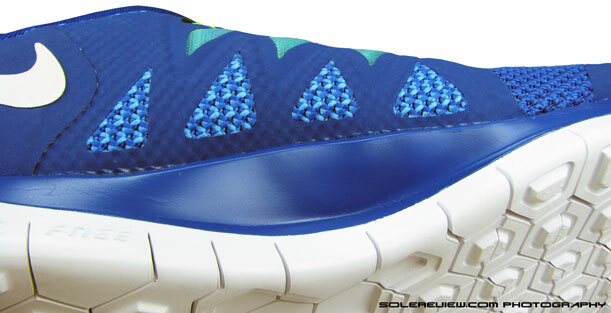 Aesthetically, midfoot design of the 2014 Nike Free 5.0 looks absolutely breathtaking. Unless you’ve got a pair of black-on-black, the different design elements come alive with a contrast of shape, color and material. 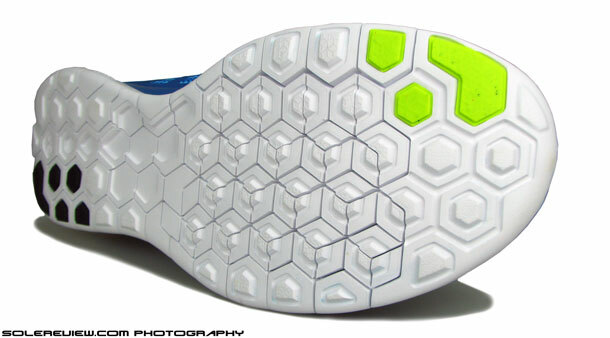 The Hyperfuse panel dominates the mid-foot landscape, and mesh underlays add that extra design dimension. The diamond shaped window at the base reveals a glimpse of the Flyknit inspired mesh, and upper see-through mesh windows gives a peek of the Flywire cords underneath. The cords begin their journey at the base of the upper and end at the top, forming loops for the laces to pass through. Tug on the laces, and the Flywire cords increase tension around the mid foot. The uniquely shaped Free 5.0 tongue. Served with sideways slide. The eye-stay design is asymmetrical, reducing lacing pressure but giving the shoe a lopsided look. The tongue is a minimal affair; it is attached to the front by a Hyperfuse layer and features multiple patterns, with two types of mesh underlays peeking through the triangular Hyperfuse windows. We were particularly intrigued by the novel tongue design, which splits the top into three separate flaps. Our first thought that it was an antidote for tongue slide. But our enthusiasm deflated quickly as the tongue slid to one side during our first test run. The thin tongue also lets the lacing pressure pass through, and tightness is felt at the top, where both ends of the laces come together. Collar is snug and pliable. Nicely done, Nike. Heel with a window. Not XP. 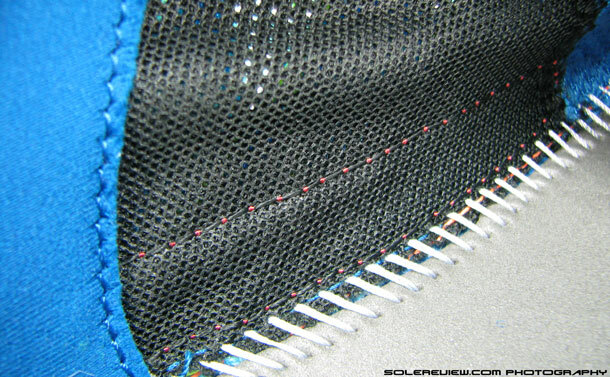 Hyperfuse layer over two different mesh types on the heel. 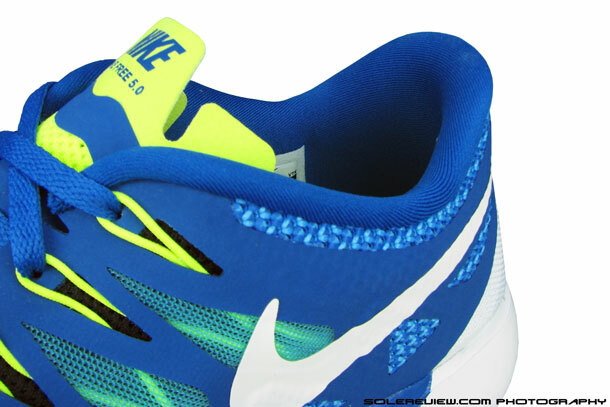 The 2014 Nike Free 5.0 has an uncomplicated rear foot design. The collar construction and material is a carry over from the 2013 version, featuring a single fabric lining backed with foam lining. The heel, has the case been for the past versions, is free of internal stiffener and is pliable as they come. It has some degree of ventilation, with a single layer open mesh over the lining fabric wrapped over the curvature of the heel. The base of the heel is covered with a near invisible layer of film, most likely placed to result in better bonding with the sole unit. Design and construction: Updates on the sole unit. No sideway grooves. No gap. Better flexibility. For the first time since 2004, the sole design transforms itself with radical newness. The new geometry ditches the familiar layout of intersecting linear flex grooves and progresses towards a setup favouring hexagonal columns separated by deep but razor thin flex grooves. Each column of foam act as independent structures, acting as cushioning or transitional units whenever they are called upon. The flexibility radiates in multiple directions, as opposed to the somewhat linear flexing of the older design. Rubber usage is minimal and limited to outer heel and forefoot tip. Visual lack of rubber might alarm some, but based on our past experience (with Free) the foam should be hardy, capable of lasting hundreds of miles before affecting ride performance. We’ll make a note to update this section after long term ownership. Prominent flare below arch. Supports nicely. The forefoot and rear foot also loses the prominent (and outwards) flare seen in the past models – they are rounded off, and the top profile appears narrower. Initially, it might seem that the shoe is less stable, but start running, and the rounded edges only add to improved transition. Under the arch, the midsole flares add up as a support, and the underfoot is a Ortholite insole lined with a foam strobel. There’s no denying it. The ride is lovely. The 2014 Nike Free 5.0 has been thoroughly re-engineered, right from the upper materials and design to the striking new sole in its hexagonal glory. That is impressive, but what really shines is how all the new parts are so well glued together. And we mean not only structurally, but on the playfield. The forefoot is roomy, sufficiently ventilated and bends nicely. The Flywire cords in the midfoot do their bit to hold the foot in place. The collar has a padded grip on the ankles and is non-interfering. 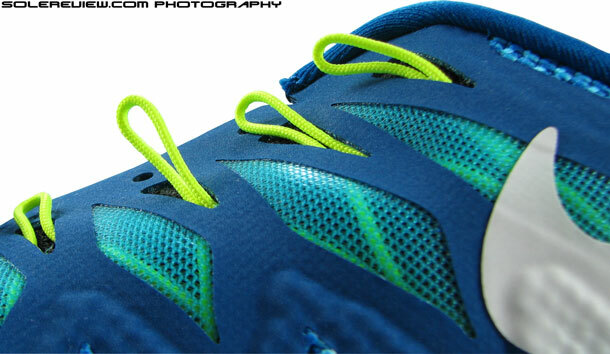 But the real magic lies in the how the new Free outsole behaves. Test run after test run, the shoe delivered a ride which felt truly effortless and a transition equalled only by a few others. You see, the old Free had two things which this new one does not. Firstly, the original Free configuration depended on deep flex grooves cutting across each other at 90 degree angles. Which meant the sole had deep flex grooves go from one side of the shoe to another. 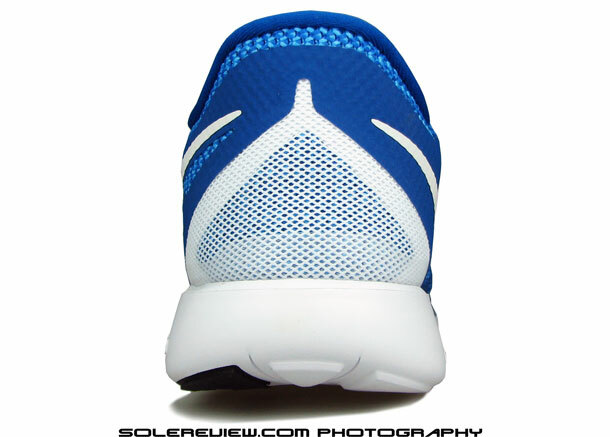 During runs, the weight would transfer from heel to toe and splay open the outsole in the process. The splaying of the sole meant gaps between the foam above which the foot had to roll over, the result of which was a broken transition, especially in areas where the pressure led to flexing. The heel and forefoot area were good examples of that happening. 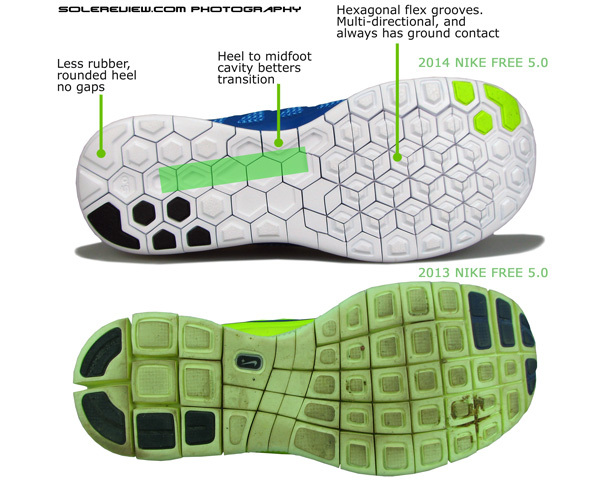 The 2014 Nike Free 5.0 corrects that by use of smaller, hexagonal shapes in the outsole which are closely nested against each other. So when the shoe flexes at forefoot during push offs, part of the outsole foam is always in full contact with the ground – unlike the earlier version where the pressure would be on the chasm between flex grooves. No outsole flares under the forefoot and heel. Tucked in. 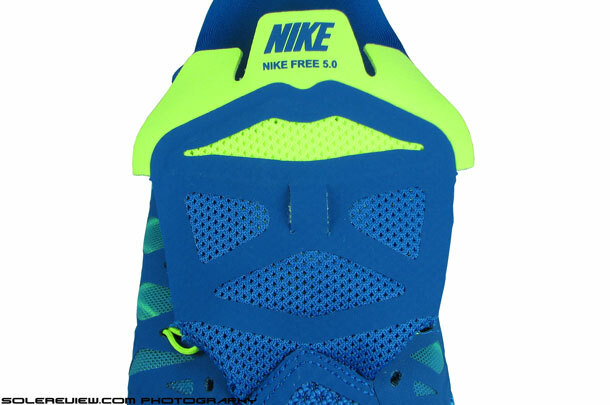 Secondly, the new Free gets rid of midsole flares in the front and heel and tucks them under the upper. The positive outcome of that is less pressure on the edges, and a ride sensation which feels like the weight is spread evenly across the outsole. Foot-strike transition is extremely smooth, in absence of any underfoot gaps or pressure points. The ride is also helped by the rounded-off heel area, which betters the landing experience for heel strikers. 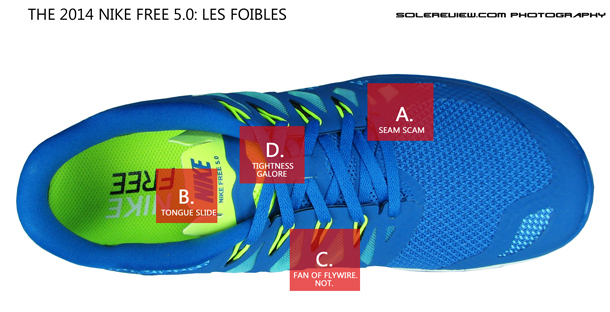 The 2014 Free 5.0 also scoops out some of the midsole foam from the centre of the heel to under arch area, designed to help the foot transition smoothly during the gait cycle. Talk of the arch area, support is impressive, with a longer and prominent midsole flare just under the arch. 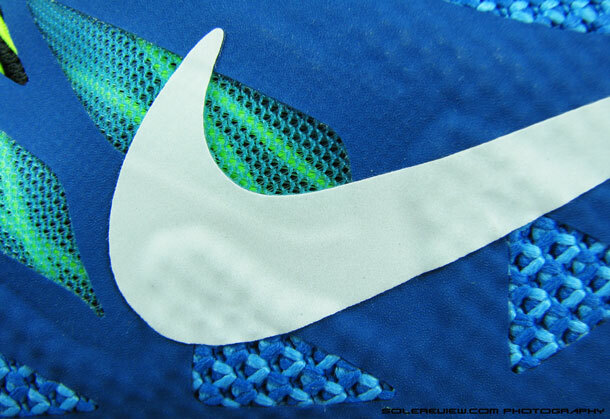 Below the insole is another layer of foam. Called the Strobel. Notice lack of Nike Plus Cavity. The removable Ortholite sockliner. Cushy cushion. The Free betters itself on cushioning too. By that we don’t mean a distracting, plush sink-in feel. The shoe delivers muted dampening throughout, as if the road you’re running on has been covered with a rubber mat. The reason behind the improved feel? The new midsole material is softer than the 2013 Free 5.0, so there’s improved material compression there. The small hexagonal lugs on the bottom also act as mini ‘pistons’, pushing inwards under pressure to take the weight off. And both of that is topped off with a few more millimeters of EVA strobel and memory foam like Ortholite insole. So while the Nike Free 5.0 will be classified by most as a minimal shoe, it will surprise many with its ample cushioning. On a related note, the Nike Plus cavity no longer features on new 2014 Nike models. 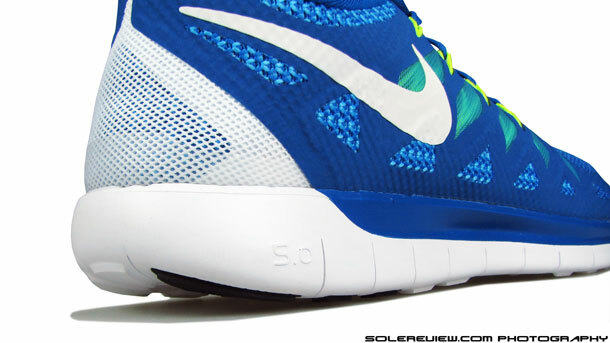 The Nike Free 5.0 is one of the newer shoes sans the cavity and the ‘Nike+’ call-out. So if you’re old school and still dependent on the Nike Plus hardware, the Free 5.0 might not cut it. Warning label. Adult supervision required. The combination of flexibility, smooth transition and cushioning makes the Free ideal for a variety of running workouts, right from fast short runs to long distance mileage. Runners moving up to the Free from full-feature traditional shoes might experience temporary foot soreness initially, but it is nowhere as bad as abruptly switching to Vibram Five Fingers. 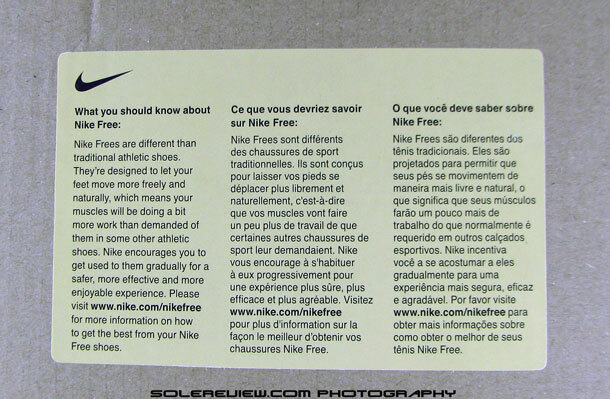 Nevertheless, the shoe box comes with a warning label (sort of) to educate new adopters on how to ease into the 5.0. Alas, not all is perfect. A) There’s this forefoot seam at the small toe base, and it digs in during forefoot flex. Not very noticeable when wearing cushioned socks, but downright uncomfortable when trying the shoe barefoot, or wear one of those thin Injinji socks. So don’t buy without trying on your size and assessing the fit beforehand. B) Tongue slide. Funny that a brand whose annual revenue is almost twice the GDP of Iceland still makes $100 shoes with tongue slide. 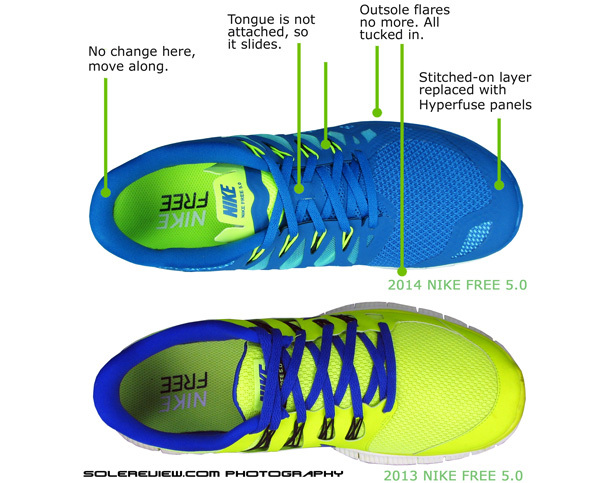 In the 2013 Free 5.0, this wasn’t an issue because the tongue was properly gusseted (attached to the sides). The 2014 Free 5.0? No sir, the tongue is a free agent, going into a sideways slide. Really, Nike? C) We’ve never been a 100% convert of the Flywire cord lacing system. They localise pressure too much during forefoot flex, and in our case, we felt a more than ideal tug on the arch area during runs. The sensation increases with speed, as the foot flexes and correspondingly applies a higher pressure on the lacing system. The original Flywire system worked great, with Vectran fibres sandwiched between urethane panels. (2010 Nike Lunaracer is a good example). The cord based lacing is too buggy, and we wish the Free 5.0 moves to full or partial Flyknit like its minimal 3.0 and 4.0 brethren. D) The lacing pressure is tighter at the top where the laces tie together. The tongue is un-padded so the pressure is directly transferred onto the foot. E) Lastly, the deep flex grooves are prone to trapping debris, practically making the Free 5.0 outsole community living for small pebbles, dead insects, wood chips and things of that nature. 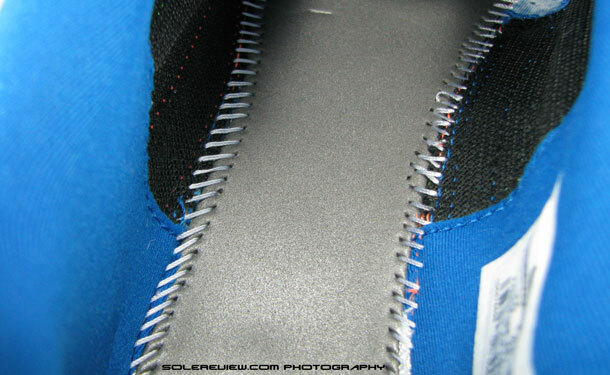 Nothing can be done about this as deep cuts are fundamental to the Free outsole design. So while you’ll have to live with it, care should be taken to restrict usage to clean roads, running tracks and treadmills. There’s no denying that the 10th Nike Free 5.0’s tenth year anniversary is a complete reset, bring in its wake a veritable army of evolutionary changes, most of it impressive. The high point of the 2014 Free 5.0 is its redesigned sole unit which delivers a smooth, cushioned ride with a seamless transition and multi-directional flexibility. The upper is re-decked with new materials and construction techniques, and barring a few gaps, the overall package would please most runners. Upper kinks notwithstanding, the fact that the new Nike Free 5.0 platform has immense potential is unquestionable. At which point, we cannot help but think that the new 3.0 and 4.0 Free Flyknit models would make for interesting reviews. Soon, soon. We’ve covered a lot of the improvements and changes comparing the 2014 version with its earlier version, but here’s a recap. All in pictures for easy reference. Want to know the difference? Easy peasy. We like all the changes. Except the tongue. I am in such agreement, Nike annoys me so much on a ton of their running shoes how the tongue is not gussetted and I experience tongue slide. I mean how hard is it to fix this minor but highly annoying problem?? Use an internal fit sleeve or attach it to the sides of the shoe through many multiple ways. Tongue slide is a pattern engineering problem in many Nike running shoes. While gusseting is a sure way of fixing tongue slide (besides making the fit better), one small change can vastly minimize the issue. If you notice most Nike shoes, the end of the tongue (where it meets the foot) is flat or forms a protruding ‘lip’. So during runs, when the foot flexes, it will work to move the tongue out of its way – this results in the slide. Another way is to pad the centerline of the tongue so that it raises upwards. This will lock in the component when laced over and minimize tongue slide. Does the tongue slide actually result in it rubbing and creating blisters? Or is it just more of a niggle/annoyance? Ive just purchased the 2014 free 5.0 and also the Lunar flyknit 2 but can’t decide on which would be better. Ive read that the heel on the lunar is very rigid and results in rubbing on the achilles but otherwise is excellent. Im new to running, it’ll be on pavements, probably often in the rain, and no more than a few kilometres. Ive a very slender/slim foot. If anyone could offer advice it would be most welcome. More of an annoyance, really, Tongue slides seldom cause blisters unless the shoe is badly engineered. If you’ve got both the shoes, it’d be good to rotate them and see which one suits you better.The FL 2 and Free offer different benefits – like cushioning vs lightweight flexibility. Yes, the heel on the Lunar 2 is rigid, but if you are running a few kilometers every day, it should not be a bother. You’re welcome. Please share your feedback here when you think you’ve got enough miles to assess which shoes works better for you. I really miss the outsole flares, gave the shoes a cool look from a birds-eye view. Other that mine have been treating me great. The outsole flares gave the shoe more stability too! Just wondering how do these shoes perform in obstacle style races say tm or spartan race? I just bought a pair of these and i am planning to use them in a obstacle race that is set up in a semi urban setting ( lots of gravel to run on) what i am worried about is the grip. I have been using vibram five fingers for a long time and only making this transition for the race. Is this a wise decision? I have ran in these a couple of times in a semi trail environment that too without any socks. I found them to be ok but experienced some amount of friction on the side of the foot. Is the gravel you’re running on fine or coarse? Coarser/bigger ones will get stuck in the flex grooves. Yes, the inner seam tends to rub, especially when you don’t have any socks on. Yes, compared to a traditional trainer, these are not as cushioned. Take some time getting used to. Thanks for sharing the picture, the color looks great! I like the design of last year’s Free 5.0 much better. No, like the ones in the original Lunarglide. So the lunarglide 6 is using flywire chords? Get the Flyknit 4.0. Cooler to look and comfortable to wear. Is there any alternative to this you’d recommend for those of us with wide feet, since it only comes in standard widths? Even half a size up, the forefoot is just too tight on me. The Nike Free 4.0 Flyknit is worth a fit trial. just visited a Nike store where i tried on the Free 4.0 and Elite 7. Now, Elite 7 is interesting: Good cushining under forefoot (better than Hitogami) and the fit is very good. But the funny thing about Elite 7 is that when i walked around the store in them it felt like this is a shoe that ….promotes pronation! and here comes my dilemma: i’m a mid-foot/forefoot runner and i understand what to expect from the 4.0 but it’s not clear to me what to expect from the Elite 7. Will it push me towards pronation? will it ruin my strike? Really hard to say without knowing the details of your gait-cycle/transition. Also need to understand specifics around your comment of the shoe ‘promoting pronation’. Also, walking and running involves different dynamics – for example, you say you are a forefoot striker, but when you walk, it is always heel to toe. So the in-store experience might not necessarily be the same as running in them. what i mean is that due to the lack of outsole in the medial part of the heel, while walking my ankle was “falling” inwards. that’s why i’m pretty much confused if this will affect my running. If you’re unsure, it might be a good idea to skip the Elite 7.
yes, i bet try on LunarLAunch as well and also find a store with a trendmill to test all 3 of them. thanks for your help. I have struggled a lot finding a good shoe with roomy toe box, due to my problem (metatarsalgia) and your reviews which are always THE BEST, are extremely helpfull. i finally bought the Elite 7 and after 50k i’m really happy about my choice. my only complain would be that they need to give more room in the forefoot area it’s a bit tight and shallow. Thanks guys again for the help!!! i’m waiting now for your review on the Hitogami 2, since i have a love & hate relationship with the 1st edition. Glad to hear the shoe’s working out for you! Hitogami 2 review will happen next month. Any idea how the Nike Free 5.0 compares to the Saucony Kinvara 5 in cushioning? Thank you for any advise! The Nike Free feels flatter and less cushioned than Kinvara 5. Not that the foam density is higher, it is just that Kinvara 5 has more volume of Foam, and there’s that Grid insert which makes the cushioning softer. Very good review and photos, agree with all the strong points: lovely ride, surprisingly cushioning and ventilated upper. The tightness at the top where the laces tie together is my only complaint. Without this review (and the online promotions) I’d have missed this opportunity, because overall i’m really liking the experience. Thanks for the feedback, and happy to hear the shoe’s doing well with you. It’s been almost a year since launch, so the new 2015 Nike Free 5.0 should release in March. Should i wait for the 2015 5.0 or just go ahead and buy the 2014 5.0? I am also considering the pegasus 31. Which would be better? The 2015 Nike Free 5.0 has started hitting retailer warehouses, so should be out by end of this month or early March. As far as your requirement is concerned – what exactly are you looking for? We ask because the Free and Pegasus are very different shoes. My feet are very sensitive after running, so i need shoes that will last 5 miles everyday.. I always get aches and cramps after running, so i was wondering which shoe woild be the best for me. If you’re getting aches and cramps, we think it is not due to shoes. Would recommend physical conditioning/strengthening and electrolyte intake. Talk to your physio or qualified professional for guidance. Would suggest the Pegasus instead of the Free, will be easier on your feet! Love the reviews. This will be the site I check first in all my future running shoes. A. Seam Scam: I have no problem with this. Maybe because I always wear a size larger to my true size as I dislike the tightness. B. Tongue slide. Yup. Nike could do a lot better with this tongue! Funny the tongue only slide on my left side and my right side is fine. Manufacturing issues? C. Yup. I am not convinced on the flywires. Wore another pair with flywire for a year previously. D. The lacing is definitely tight at the top. I had been adjusting it every time I put the shoes on. When you get it to the comfortable level the shoes could be too loose to run fast with. E. I can put up with debris being trapped as long as the rubber lasts. Thank you for the comment and sharing your feedback, appreciate it! PS: the new 2015 Free 5.0 is just around the corner, and hopefully some of the areas we found wanting are fixed. Round the corner? When is the expected release date? First week April, we think. Its launched now, I bought one pair. It’s launched now. Most retailers should have the stock by now. I bought one, and its better than the 2014 one. Great review. I bought a pair of these shoes last month and I must admit that I find it very comfortable. I bought 1 size up after reading some reviews on other sites and I find it roomy for air circulation and feet expansion. I also like the cushioning aspect of the shoes. So far I have run with these only on roads and I am thinking of running with the shoes next month at the Tobacco Road Marathon in Raleigh. The run is mostly on a trail which is a mixture of asphalt and compacted screenings. Do you think this will hold up fine? I do have another pair (Adidas) which is a little old which I can use, but since I’m more comfortable with the new one, I was thinking of going with this one. Your suggestions please? If the shoes are to your liking, don’t change them. Besides, compacted screening should be not be an issue with the Free outsole. Great Review. I am looking to buy these shoes sometime. How is the traction of these on wet roads? The minimal use of rubber on the outsole had me worried about this. What do you think? Should I wait for the 2015 version? Foam traction is never great on wet. Buy something with more rubber underneath. The 2015 version just has a new upper, so the sole design does not change, same as 2014. Thanks for the reply. Perhaps I should look at something else then. The Nike Lunar launch might interest you. Seems to have the same Free fit, and 4 mm heel to toe drop. A bit squishy, but plenty of outsole rubber for traction. I got the new Nike Free 2015 edition instead. Somehow the local Nike store didn’t have the Lunar Launch. I can confirm that most of the gripes you listed in the review, with regards to the upper, are gone. 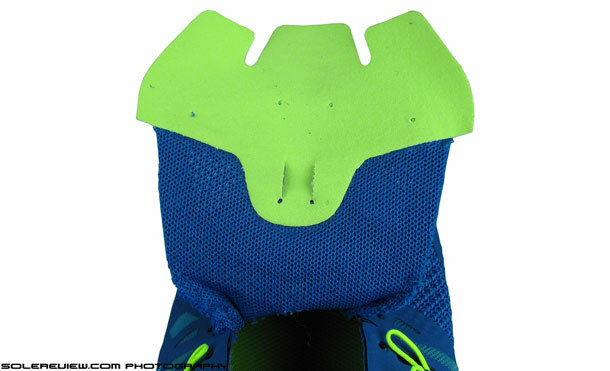 An attached, padded tongue is the main new change in the 2015 version. Cheers! Thank you for the feedback, look forward to testing them in May or sometime around that. Thanks for your wonderful review! Quick question: I found the tongue lace pressure to be quite noticeable when wearing it. It’s not to the point of pain, but it is uncomfortable. When I tried a half-size up, the pressure lesson, but the toe box area loosen as well. Other than that I do quite like the sole design. Should I keep my usual size, or go half-size bigger? Does the 2015 version change the tongue design? Thanks! Trying skipping lacing through ALL the Flywire cords, and see whether the pressure eases off in your regular size. Can’t say about the new 2015 upper, have no miles in them yet. Thank you for such great insight into choosing a shoe. I haven’t been able to find information that really breaks down (literally sometimes!) the shoes and allows me to feel informed when I go to a store to try shoes on. Could I ask for some advice? I always ran (strong heel-strike) in brooks adrenalines, but once my skill increased I shifted to a more comfortable mid-foot strike and immediately got shin splints from the adrenalines. After a month off, I was advised to try nike free 5.0, and they were magical. That is, until I started increasing mileage. As my long runs reached 17-18 miles, IT band issues popped up. I haven’t run longer runs (5+ miles) in about 4.5 months to heal, and am ready to start increasing mileage (slowly!). My PT said a neutral shoe with substantial cushioning, specifically in the forefoot, is preferable. I am looking at the Hoka clifton, New balance 890, nike lunarglide, and nike flyknit lunar as an everyday trainer. Do you have other shoe suggestions/ are the aforementioned shoes a bad choice for my running needs? As far as the Nike free 5.0 goes, it is an awesome shoe that suited me really well for mid-distance (5k to half marathon) distances and provided a platform for me to decrease my 5k time by 3 minutes in about 4 months! Thank you so much. Again, this site rocks! You’re welcome. So happy to hear our reviews are appreciated! Looking at forefoot cushioning in isolation, the Clifton would come up on top, followed by the Flyknit Lunar. We haven’t reviewed the 890, and the Lunarglide forefoot might be a bit firm for your liking. The Nike Lunar Launch is worth a fit trial. 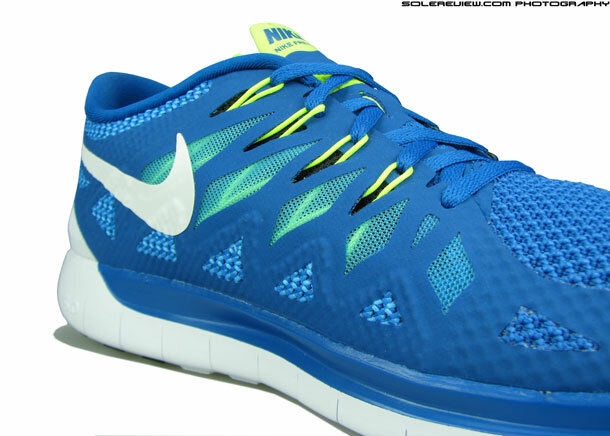 It seems to be built on a Nike Free last, which means you’ll feel at home as far as the fit is concerned. 4mm heel drop, so conducive for late stage rear-foot or forefoot striking. Full Lunarlon midsole, hence cushioned as they come. If you don’t mind a ‘slow’ shoe, then the marshmallow-ey Nimbus 17 (yes, the latest one) is something you can try too. Just wear all these models at the store and see what feels best. Fantastic review! Thank-you for providing such detailed reviews with plenty of images, I have been unable to find a site that even remotely comes close to the quality of reviews that you provide! 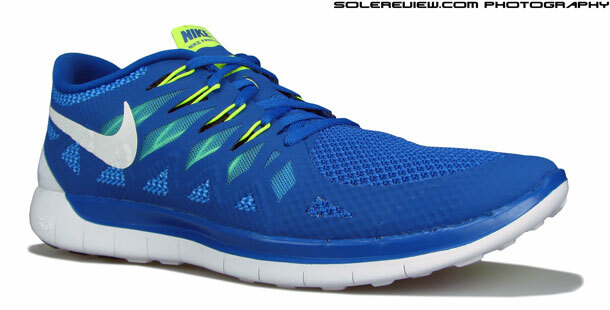 I am currently looking for a new pair of shoes, and am considering the Nike Free Fit TR 5. I have noticed that they are almost the same as this (the sole is almost identical but has a little more rubber). I need a pair of shoes that I can do football umpiring training in (about 5-10km on grass) as well as 1 hour of running on paved areas and then walking around on for the rest of the day. Is this a shoe that is suitable for my needs, or should I consider a different model? Alana, thank you for the kind comment. Great to hear you like our reviews. Haven’t tested the Free TR 5, but the shoe should do ok unless the grass has dew. Exposed foam midsoles and wet surfaces don’t mix well. Good review! The back of my Free has folded downwards and it looks awful, is this normal? Haven’t seen something like this before. Is it across both left and right shoes? Or only the right? If so, do you drive your car in these? Then why not the Zoom Vomero 10? Very wide forefoot, cushioned yet not mushy. The Zoom Elite is narrow in the forefoot, and the Free and Zoom Fly won’t match upto Vomero 9’s cushioning levels. I really like the Free 5.0 2013… i tried the 14 and i found it not as soft a ride.. i run 40 miles a week on the 2013 version.. is there something else out there similar , asics or otherwise that would give me similar ride.. if not better than just to have variety? There aren’t many shoes with a similar ride to the Free 5.0 (flexibility, full ground contact). Perhaps the New Balance Zante might do it for you – not similar, but cushioned without the weight.